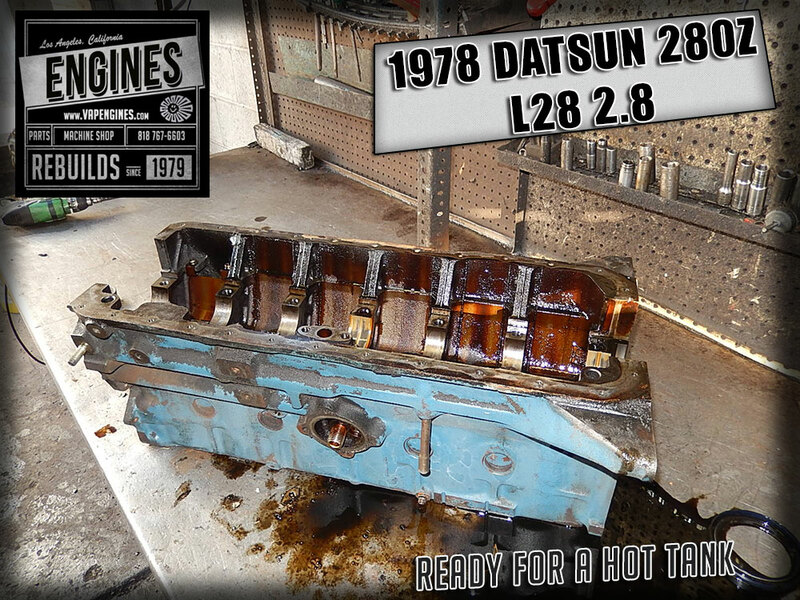 1978 Datsun 280Z is a cool sporty 2 seater with an inline-6 2.8L engine. 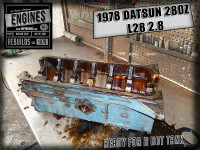 Nissan released them from 75-78. 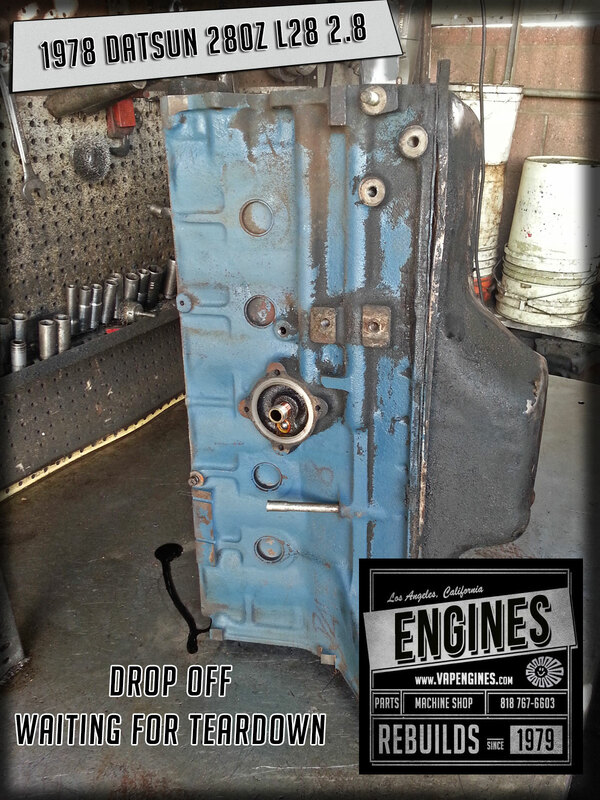 One of these beauties came in needing a short block engine rebuild. 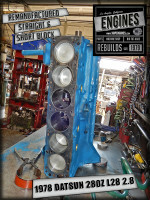 The Rebuild Plan: Teardown and Inspection, Hot tank and clean. 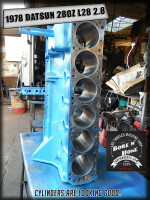 Bore and Hone engine block. Grind Crank and Cam. 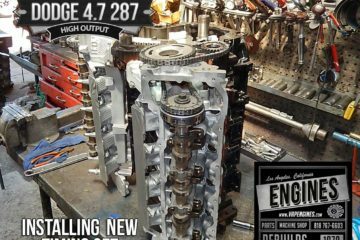 Engine Rebuild Kit with New pistons, rings, engine bearings, freeze plugs, and timing set. First off we need to tear it down and get it hot tanked and scrub off years of grime and grunge. 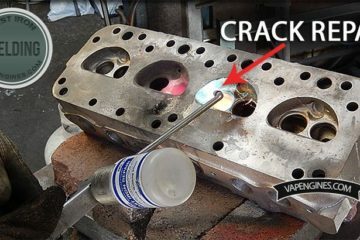 We check for cracks or damage, this one looks good so it’s off to the bore machine. A few before shots. 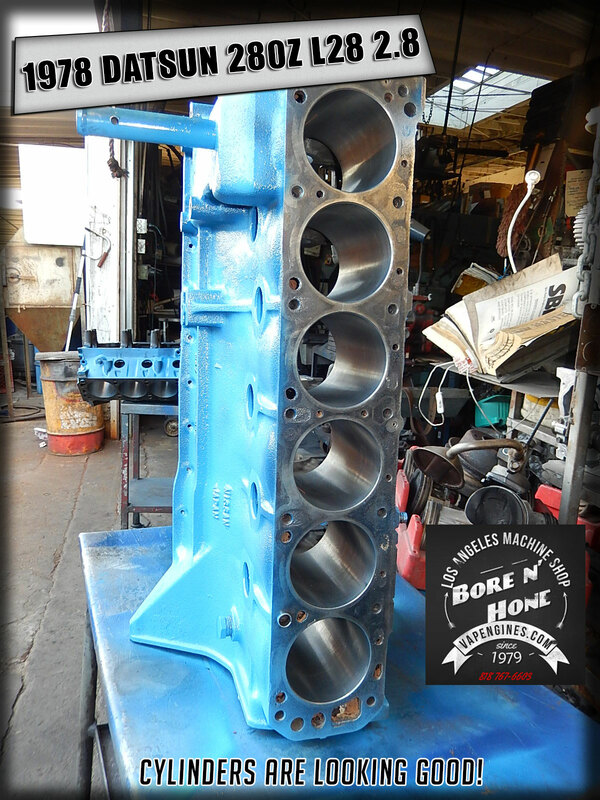 Next we bore and hone the cylinders to the proper finish and order the correct pistons. Prep on the block is done, it has a coat of new paint and a second cleaning. It’s ready for some parts. 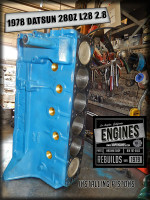 We’ve already ground the crank, hung the new pistons, installed bearings and freeze plugs. 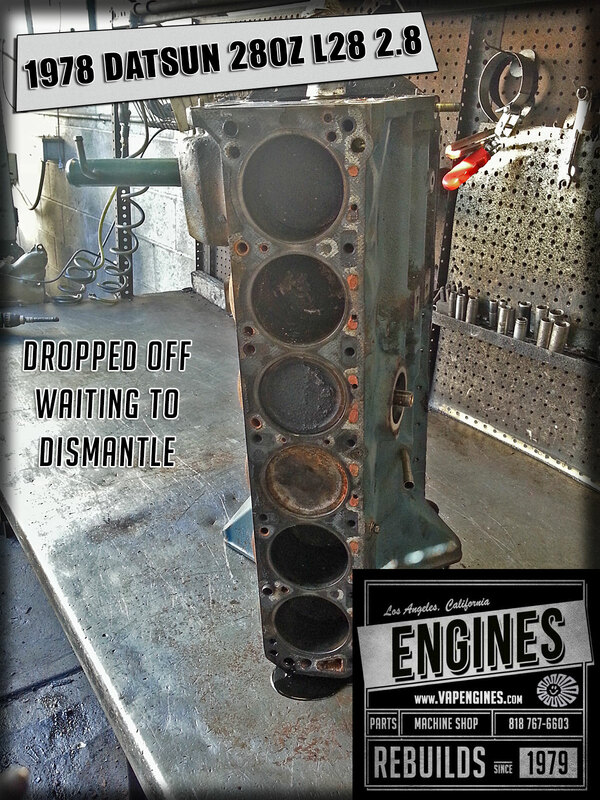 Timing kit is on standby and we are ready for the short block assembly. 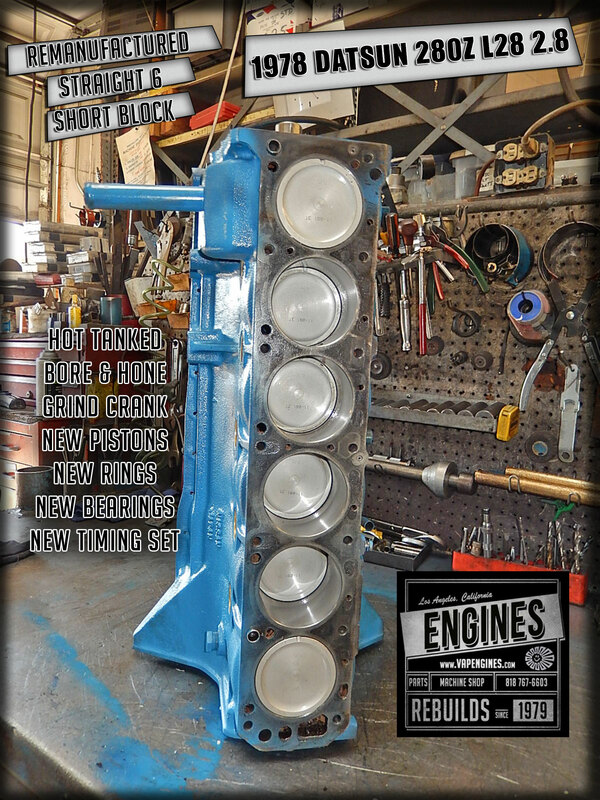 Check out the rebuilt 280Z straight 6 short block. It’s looking good. 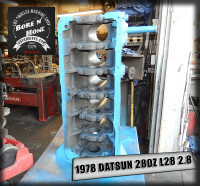 Your rebuild can look like this one, contact us for your Datsun 280Z rebuild project. 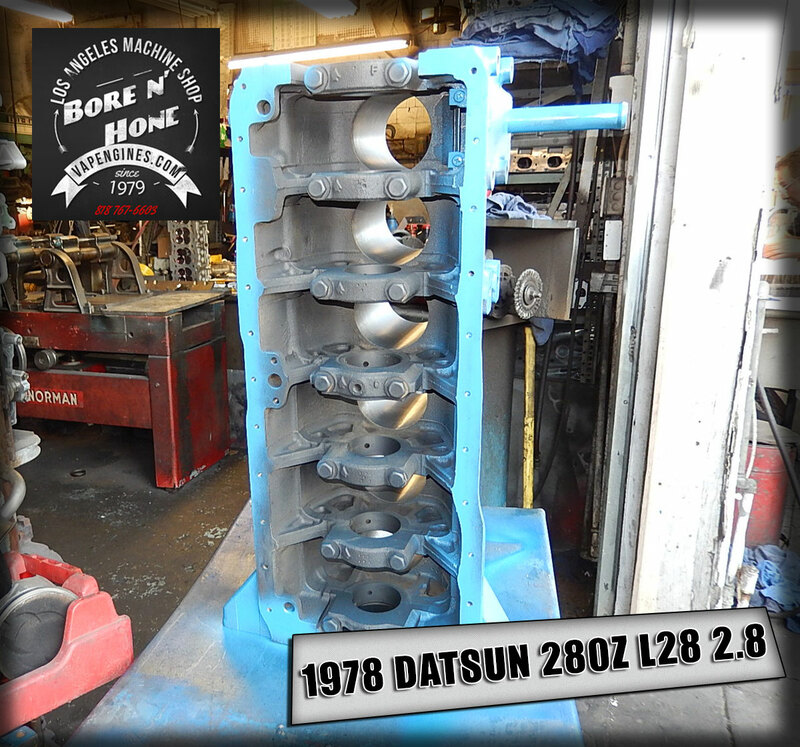 Rebuilt remanufactured 1978 Datsun 280Z 2.8 straight 6 short block at our Los Angeles machine shop. 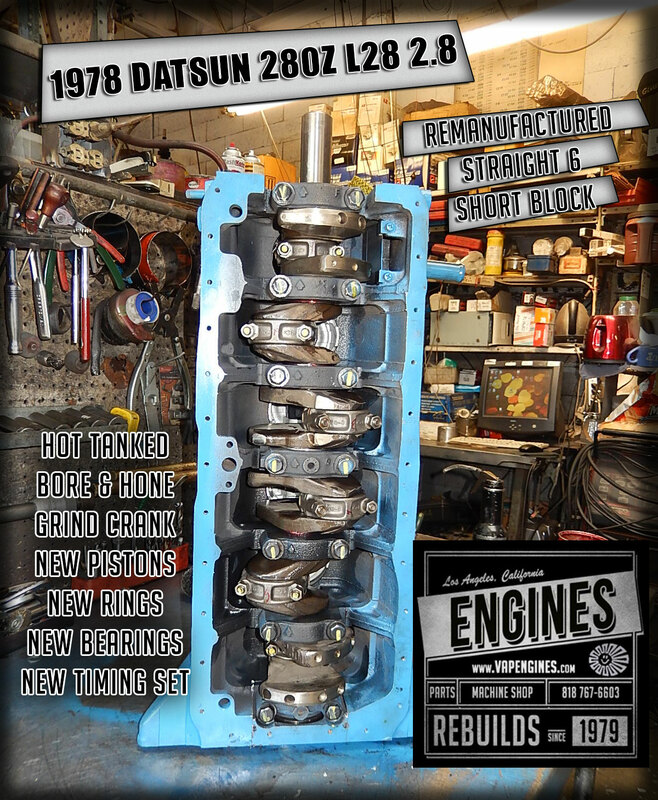 Need engine parts for your Datsun 280Z rebuild? Contact Us. Need a Datsun Nissan short block or long block engine rebuilt? 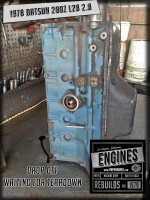 Full service Machine Shop on site. 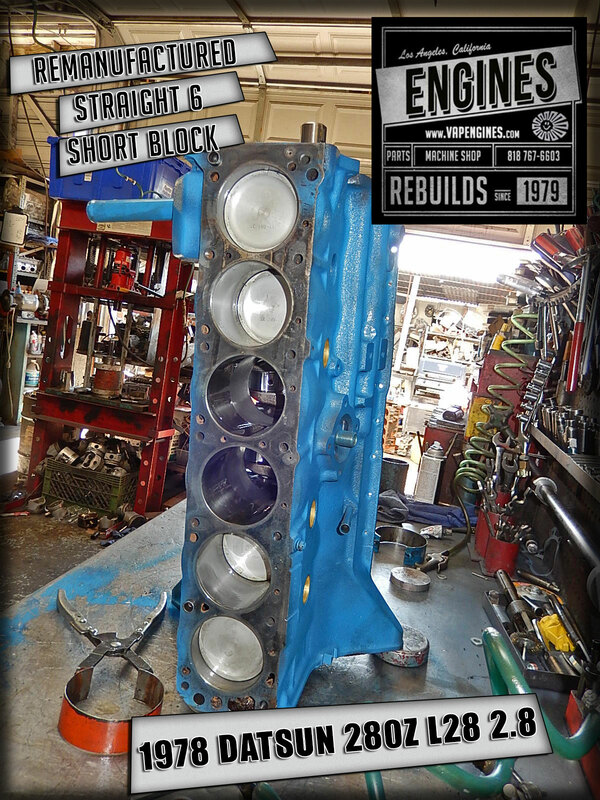 I have a 240z block and 280z head that I would like to have checked and rebuilt, possibly bored .30 over. Can you help? 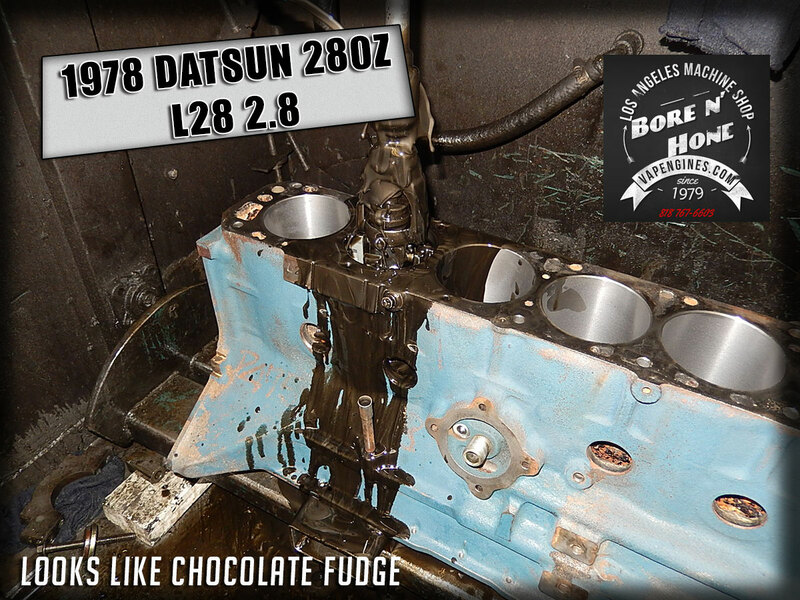 Yes, we can do the Machine Service and Engine Rebuild on your Datsun 240Z/280Z. I sent you an email with an estimate. 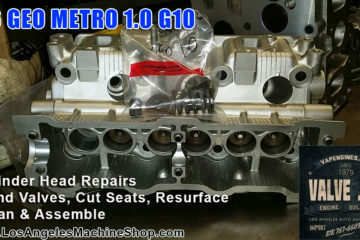 I need a quote to rebuild and 78 280z engine. 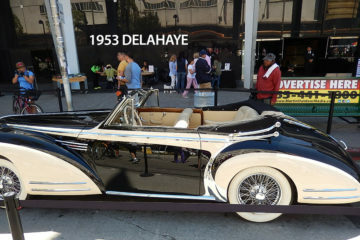 its in great shape but want to rebuild for the last time and put it on the road !! 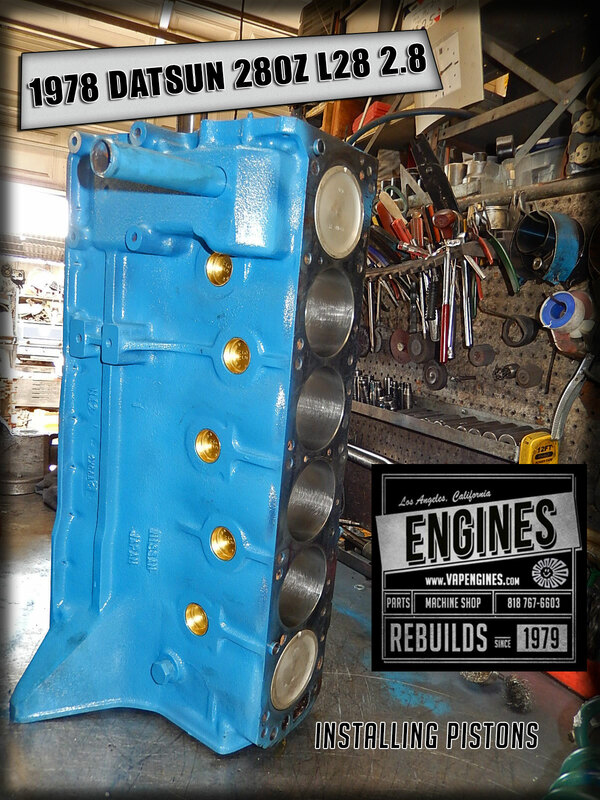 Thanks for contacting us for a quote to rebuild your 280Z. I’m emailing it directly to you today. 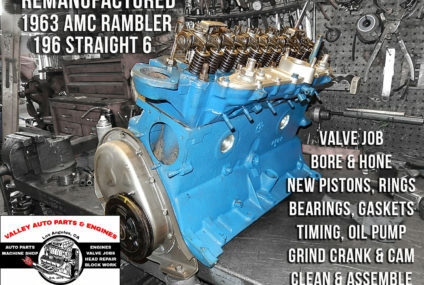 May I have a quote on a rebuild on a 1975 280 z engine. 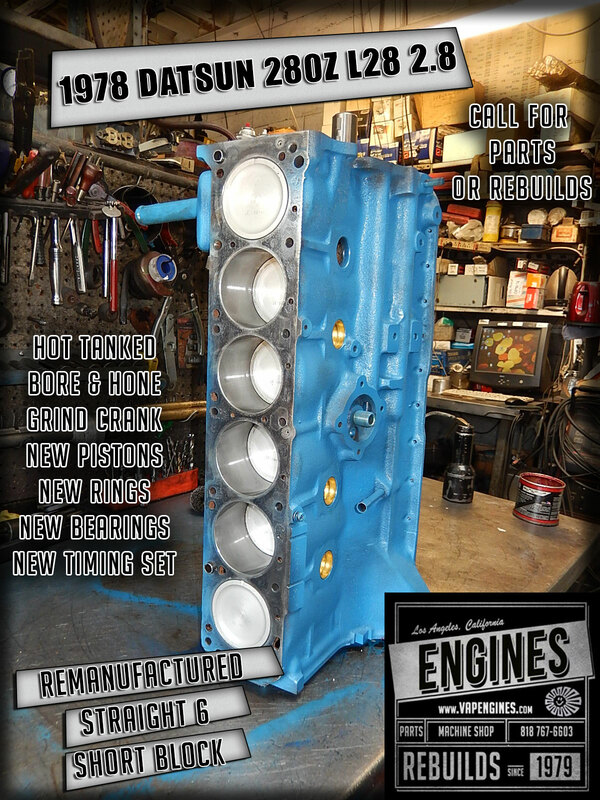 Thanks for contacting us, I just emailed you a quote to rebuild your 280Z engine. 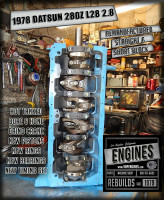 Thanks for contacting us, I’m sending you a quote to your email on your Datsun 280Z 2.8 engine rebuild. Thanks for inquiring. I sent a quote to your email address. Also have a tech question. Just checking back with you. 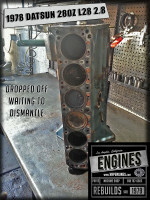 Did you get the bore size on the engine block yet?